Thanks to the traction solution (through push handle) and manual lifting, it represents the ideal solution for the service to machines in any part of the company, even in areas without power supply. hanks to the lifting system with piston in vertical position, without pantograph structure, it is possible to contain the dimensions; GAMMA 800 M thus becomes the ideal tool as work table for the operator or service to the machine tools. The safety of operators is the main requirement when designing machines; structural calculations and simulation programs lead to the creation of highly resistant frames in order to ensure maximum safety even with full load. 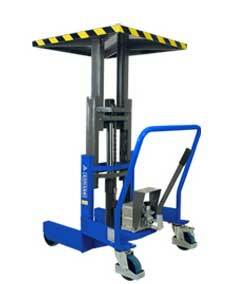 The complete safety equipment includes a parking brake and an ergonomic push handle. The safety of operators is the main requirement when designing machines; structural calculations and simulation programmes lead to the creation of highly resistant frames in order to ensure maximum safety even with full load. The complete safety equipment includes emergency button, parking brake and protection fuse.